Matt Dillon:Doc, that’s the first time I ever turned an outlaw loose. Matt Dillon: Kerrick. I saw his picture the other day on one of those circulars. Andy gets into a fight in the bar, the saloon. He didn’t start this fight, but he’s ready to stand up to this other man. 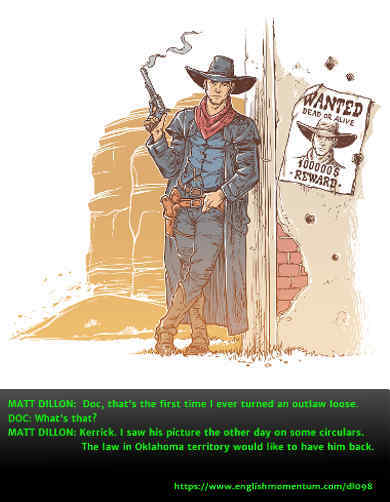 Matt and Doc are in the saloon at the time and hear the talk at the bar getting more and more heated. In the middle of it all, Matt catches the name of the stranger. Andy seems to know him and calls him Kerrick. Hmm… Kerrick. That name seems to ring a bell for Matt, but where did he hear it before? Then he remembers the wanted circular that just arrived. He hadn’t posted it yet, but it was in his office. Kerrick, yeah, this guy is a bad dude! Andy won’t back down. He’s ready to get into a gun fight with Kerrick. Problem is, Andy’s drunk and he doesn’t realize how drunk he is. Matt steps in and breaks up the fight and chases Kerrick out of town. Perhaps he should have let them fight and then arrested them both, but instead he let a criminal go free. What was he thinking? Matt let Curric go free even though he knew he was wanted for murder. What do you think of his reasoning? Is his strategy foolish or wise?